Orange & Turquoise Vintage “RANGER” Seed Bag Shoulder Purse | w3bCh1ck! I felt like making something bright and oh, baby did I! 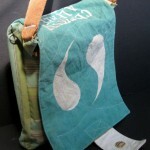 Turqouise canvas seed bag, pin-striped nylon orange lining, & a striped upholstery fabric in soft shades of green and blue. This bag is nice and tall but not too wide, making it a comfortable size to carry. 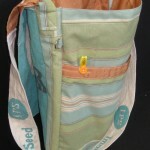 The shoulder strap is also made from the seed bag & reads ‘Improved Planting Seed’. There is a snap closure on the front behind the beautiful tiger striped button and an outside pocket which runs the width of the bag. Click on the images to view more pictures on my Etsy store!